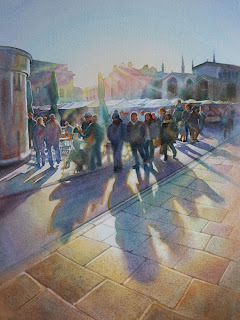 Gilly Marklew watercolour artist and tutor: The Cambridge journal have a Feature on my painting. The Cambridge journal have a Feature on my painting. When Cambridge appears in Gilly Marklew's paintings, the city's iconic architecture plays second fiddle to its people. She captures them having coffee in the Grand Arcade; stopping to admire the famous Corpus clock; walking across the Market Square just as the sun begins to fall. All are perfectly ordinary scenes: immortalised in Gilly's luminous watercolours, they become captivating. "The people of Cambridge do seem a particularly attractive lot," smiles Gilly, "and they're interesting to paint. I'm inspired by group scenes in particular and Cambridge is absolutely brilliant for that - providing some terrific backdrops, of course. "I'm a bit naughty: several of my paintings are from photographs I have sneakily taken of unsuspecting Cambridge folk. I sometimes wonder if they have ever seen themselves." Gilly is also fascinated with light and shadows: her painting of the Market Square, pictured, displays a natural wonder known as 'halation' - lit from behind, the scene takes on an almost other-worldly glow. Gilly's artistic abilities were first spotted at nursery school: "My teacher asked me to draw her portrait, which I did: her beehived head, pearls, tweed two-piece - that dates me..."
Gilly, who lives in Bassingbourn with her author/illustrator husband, has been a professional artist in some form all her life; among other things, she's illustrated magazines, children's books and adverts. Nowadays she combines teaching with painting. "I'd describe my work as definitely figurative and representational, but I don't want to get stuck in a box," adds Gilly. "I'm always wanting to explore and experiment." Gilly is exhibiting with the Society of East Anglian Watercolourists at the Edmund Gallery, Bury St Edmunds, from July 20th to 26th. To find out more about her work - and her day and evening classes in watercolour and drawing - go tohttp://www.goodworks.myzen.co.uk/GillyMarklew/Site/Home.html or simply google Gilly Marklew. This message has been scanned by MailController - portal1.